Anne Lavrand, head of Electravia, shared this news in her blog this morning. Following its initial flight at the Coupe Icare in 2011, the electric airship Iris Challenger was slated to make a cross-English Channel attempt later that year. Unfortunately, prevailing winds prevailed against that November attempt between Dover and Calais. 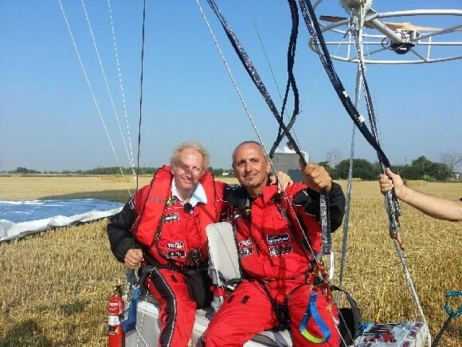 Patience and careful planning finally paid off for pilots Pierre Chabert and Gerard Feldzer, though, and today, they made the crossing from France to Dymchurch, England in two hours and 23 minutes. Built by Airstar (Chabert is founder and president/CEO of the company), the envelope contains 568 cubic meters (20,059 cubic feet) of helium, and can carry a payload of 200 kilograms (440 pounds). Equipped with two electric motors of seven kilowatts (9.38 horsepower) each, and two counter-rotating 1.3 meter (51.1875 inch) propellers made by E-Props, the 14 meter (46 feet), six meter high envelope navigates at a cruising speed of 15 kilometer per hour (9.3 mph). Its lithium polymer batteries allow four hours endurance, leaving a good margin for this particular flight. According to Aerobuzz, a French aviation blog, After a good start with favorable winds, the airship lost its following lifeboat, which also provided radio links. Feldzer then radioed that Iris had lost contact with the English recovery team. With an hour left to reach the English coast, the team finally saw the English coast and re-established radio contact. The wind shifted, however, driving the balloon east. It finally touched down at the coastal town of Dymchurch after traveling about 40 kilometers (24.8 miles) at an average air speed of 10 knots (11.5 mph). The team looks forward to setting a speed record for airships in 2014, crossing the Mediterranean in 2015 and the Atlantic in 2018. Almost needless to say, they won’t be assaulting these records in Iris, but plan on building a new ship for each new challenge. Airstar is a French company specializing in specialist lighting, but with an interesting offshoot of crafting airships that levitate on either helium or hot air. They’ve even constructed the inflatable hangar that protected Solar Impulse on its Cross United States 2013 flight. Their lighted balloons are used for events lighting, in industry, and in rescue efforts. Their airships are used for wildlife observation, taking scientific samples, and for other technological applications. The pilots are distinguished in many ways, and their accomplishments reach far beyond the immediate event. Pierre Chabert, inventor of the lighting balloon and president/CEO of Airstar Space Lighting, won an Academy Award for technical achievement in 2003, specifically given for “the introduction of balloons with internal light sources to provide lighting for the motion picture industry.” His balloons have illuminated Titanic, Pirates of the Caribbean, and countless other films. Gerard Feldzer has been an airline pilot, head of the Musée de l’Air at le Bourget, and since 2001, vice president of Zebunet (a micro-credit organization for poor farmers in southern countries). He also founded “Les ailes de la ville”, which provides training and integration for young suburban people through repairing and constructing aircraft. His efforts have won him membership in the Officiers of the Légion d’honneur.